white strawberries? blueberries that are not blue?...garden discoveries! Wee Parents say: " we chose Wee Wisdom (in Beaverton, Oregon) because of the warm, welcoming owner, teachers and environment. A safe, and happy place for my son's first time out of the house. Highly recommended" "your child will receive one on one attention in a positive, structured environment. Our son is confident and excited about learning and school!" 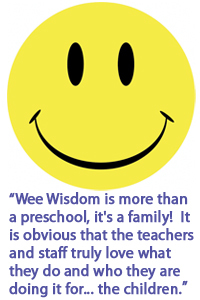 We chose Wee Wisdom Preschool in Beaverton Oregon because: What Parents Say: "many high recommendations"; "my child enjoyed the hand-on learning and discovery. The preschool prepared them for the school environment with social and behavior skills. The teachers and staff are kind, caring and amazing! They all treat your child as their own. C. G.